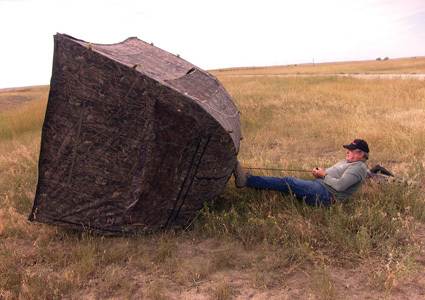 Thanks to high-tech engineering, space-age materials, and the growing legions of dedicated users, portable “pop-up” ground blinds and accessories are claiming a dramatically increased market share, especially among bowhunters. As more manufacturers climb on the bandwagon, the wide variety of innovative designs, cutting-edge accessories, and price ranges make these “low altitude hunting stations” more appealing to your customers, and more pleasing to your pocketbook. And the market is still growing! Each year blinds get easier to set up and take down, they weigh less, and are more reasonably priced. And, they are more convenient and accessible to the strong contingent of Baby Boomers, who, like me—aren’t as athletic as we once were. The average age of today’s bowhunter continues to climb, and it’s no coincidence ground blind sales are growing right along with it. I will have to admit, 15 years ago I was skeptical. Not of the comfort and convenience of portable blinds, but about how they would be perceived by game animals—especially the sharp-eyed “Super Paranoids” of the animal world such as turkeys and antelope. I had to see for myself; once I saw I was convinced. Today, your customers don’t even have to get into a blind to be convinced of their effectiveness. Magazine articles and TV hunting shows are rife with examples of blind hunts so successful and exciting as to persuade the most cynical of skeptics. Testimonies and endorsements from TV celebs like Michael Waddell, Lee and Tiffany Lakosky, Ralph and Vicki Cianciarulo, and Mark and Terry Drury also carry a lot of weight. More media exposure means more sales! You’re probably already selling some ground blinds in your shop, but are you getting all the benefits from the profit windfalls generated by a growing market? This article will help you realize the potential of the ground blind phenomenon, and how to take full advantage of the current popularity surge. I talked to archery dealers around the country, and they all seemed to agree that the ground blind market, while rapidly expanding, still has room to grow. Gable stocks blinds from several manufacturers, but says Primos and Ameristep have been his best sellers recently. He keeps a couple blinds set up on the sidewalk in front of his store, with boxed-up models stacked beside them—so customers can see what they look like folded up. Gable believes exhibiting at a large, regional consumer show every year in August does more to promote his blind sales than anything else. His sales people repeatedly demonstrate the blinds, exposing them to more potential buyers. That exposure carries over into his shops. Blinds are big sellers in Mississippi, according to Jody Brock, floor manager for Big Buck Sports in Hattiesburg. Jody says sales have increased steadily over the past five years, with a big bump generated last year by the Two Man Chair Blind from Ameristep. to the potential of bowhunting from the ground, and sales of all blinds have been great since that time—especially the ‘Doghouse’ and ‘Outhouse’ blinds from Ameristep.” Like in most stores, finding adequate display space is a problem at Big Buck Sports. They set up as many as possible in their “blind” area—plus one in front of the store. Big Buck stresses accessory sales, and makes sure to have a killer sale price on at least one model to keep interest up. Fred Lutger of Freddie Bear Sports in Tinney Park, Illinois, agrees that blind sales continue to be on the upswing. Lutger stocks only one SKU each of Gorilla and Primos blinds in his store, yet does good numbers with the two models. The key is his “hands-on” experience. 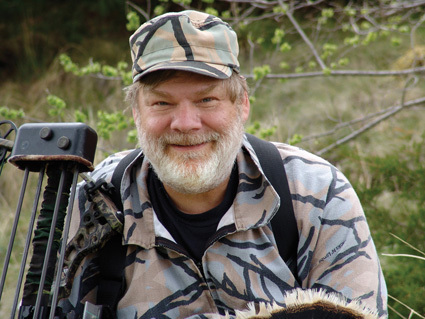 Lutger has been bowhunting from blinds for close to 30 years and his clientele respects his judgment. Some of your customers could be hesitant about purchasing blinds, because they have never had any experience with them. Put their minds at ease. 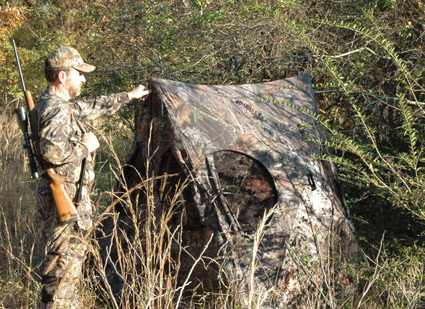 Have a special promotion featuring “hands-on” ground blind demonstrations at your shop. Set aside a Saturday prior to archery season—and get the word out! Enlist the help of the blind manufacturers and sales reps. Impose on the benevolence of the manufacturers to send their reps, and kick in some ad dollars—since you will be promoting their blinds. Ask them to consign some product so you will have plenty on hand—and yet, will prevent “over-stock” at the promotion’s end. Ask them to approve some “event-only” discounts, and kick in some swag to sweeten the pot. Make it fun! Involve the customers in the set-up and take-down demos so they can see how easy it is. Hold some “timed” events involving blind setups—for example, time how long it takes a contestant to get the blind set up, and shoot three arrows from it into a target. Or hold a “mini-tournament” shooting from a sitting position in a blind. Encourage your customers to shoot several arrows from the blind; sitting, kneeling, and standing, if room allows. You can even have contestants shoot through mesh to reassure them it doesn’t affect arrow flight. This could be held at your indoor range, or in the parking lot. Hold seminars on setups, positioning, and hunting from blinds prior to or during the event. Be sure to place some Flat Screen DVD players in strategic locations, airing “hunting from blinds” shows to convince the skeptics. If you can focus attention on the blinds and familiarize your customers with the convenience and advantages of using them, sales will surely follow. And while you’re at it, when a customer purchases a blind and the appropriate accessories, be sure to point out the obvious advantages of owning at least two of them! Ground blinds, like treestands, are here to stay. They will certainly reach a peak and level off—but currently the base market is still growing. If you go after the business, ground blinds and accessories will occupy a larger and more-profitable place on your plan-o-gram. New technology will continue to improve on what already works—and the media will continue to promote. All you have to do is put in a little extra effort. If you can become the local “go-to” store for ground blind and accessory sales, service and maintenance in your area, your future will be bright. 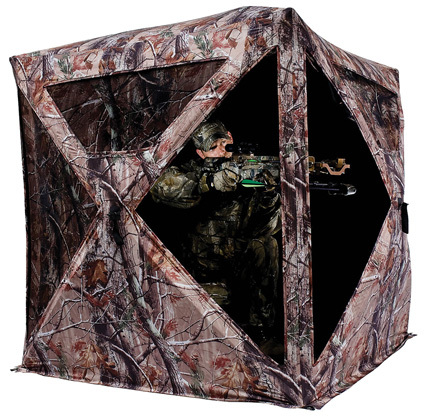 New profit centers are hard to come by these days, but ground blinds and their accessories are currently one of the best.